Starting with the one and only Carrie Bradshaw, the tulle skirt has made its way from the TV screen to the city streets, and is now one of the top fall fashion trends. 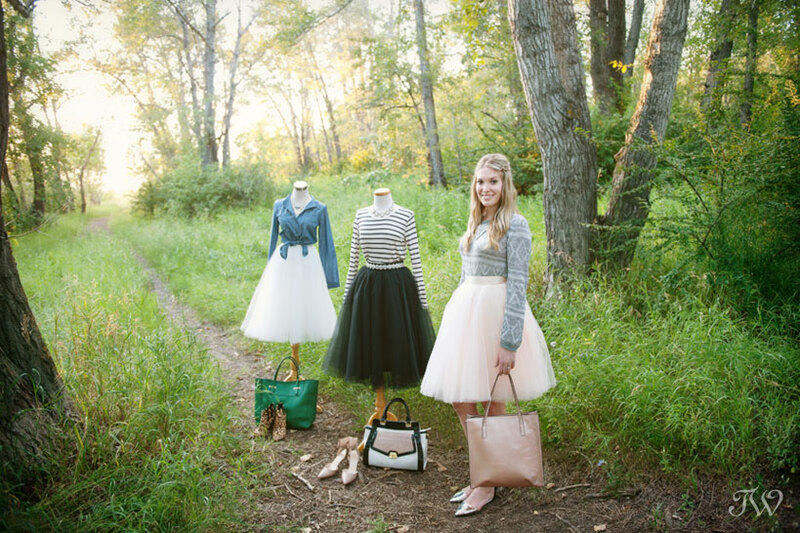 Kari from Adorn Boutique in Inglewood is now carrying an array of tulle skirts by Space 46 and styled this fashion staple in three ways, perfect as we head into fall. We teamed up for a photo shoot the other night and paired the skirts with the latest shoe fashions from Nine West Canada. Kari’s nod to Paris with stripes, black tulle, the Cherlin sandal and the Sadie satchel from Nine West Canada. 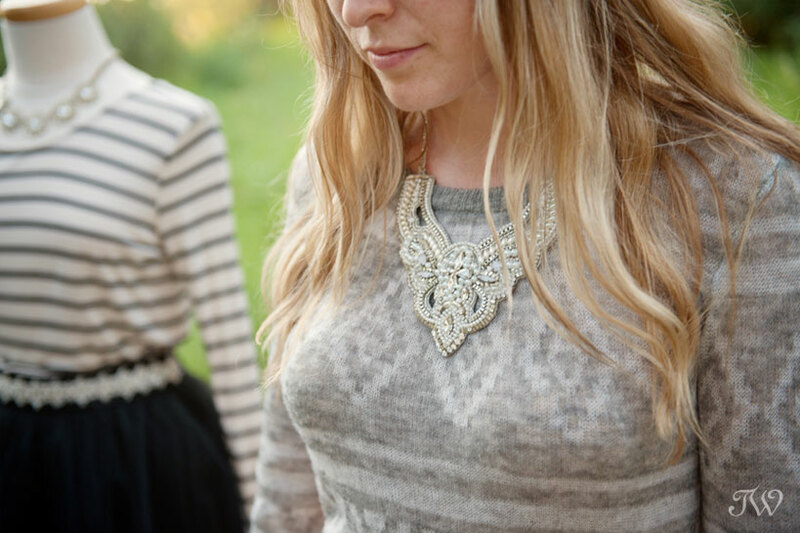 Try a cozy sweater from Adorn, a blush skirt and the Chadler flats. This may be my favourite look…chambray, tulle and leopard print Julieanne booties. 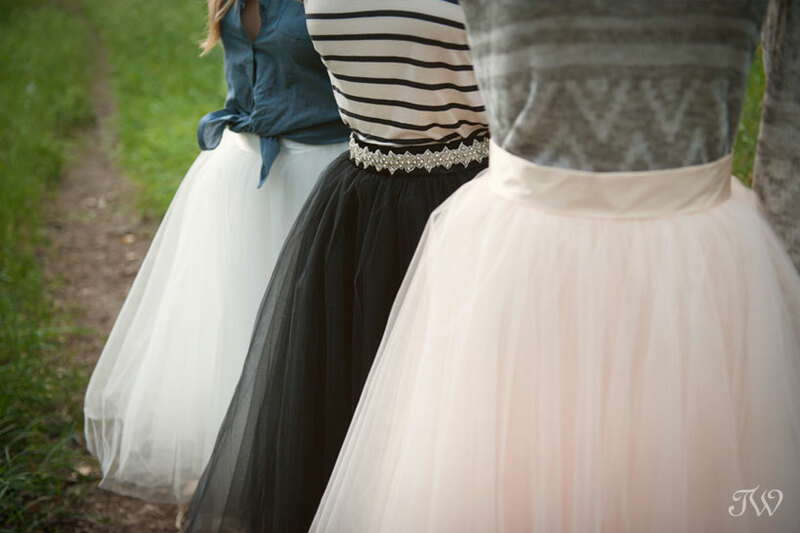 Be sure to head to Adorn for your dose of tulle this fall. 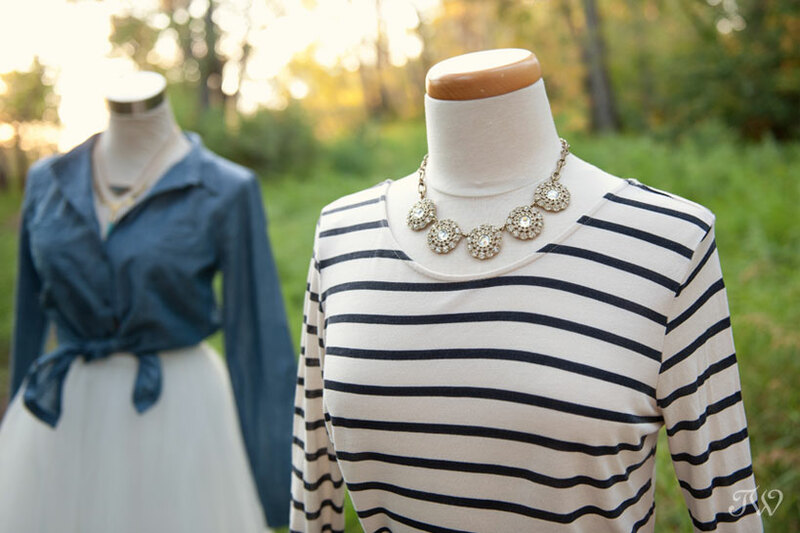 Last week I posted images from a photo shoot with Modern Girls in Vintage Pearls. Nadine, who blogs for MGVP from Perth, shared an illustration by Kelly Mekel, drawn from one of those images. I’m completely smitten. 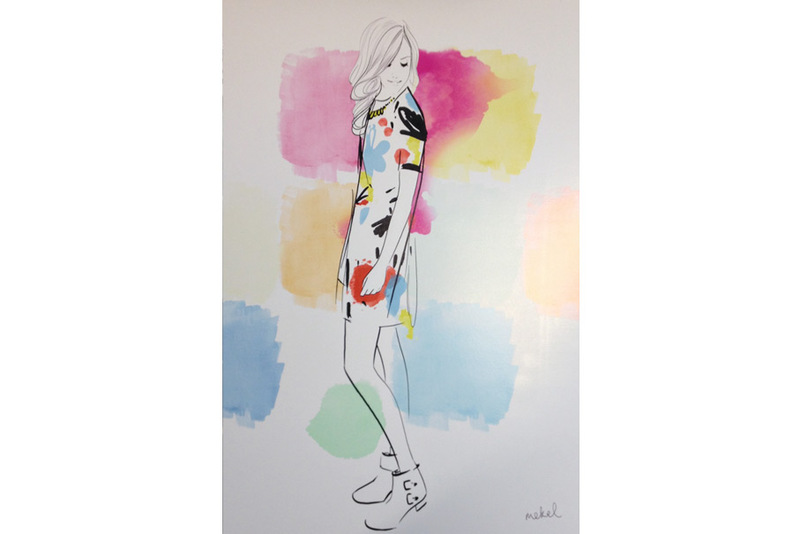 Here’s what Nadine had to say about Mekel…simple, effortless, whimsical and quite simply beautiful is how I would best describe Mekel’s dreamy watercolour illustrations that always seem to be inspired by a fascinating and exciting story! This is the original image from our photo shoot. I love this creative twist on a simple photograph. Here’s more from our colourful photography session, if you’d like to see. 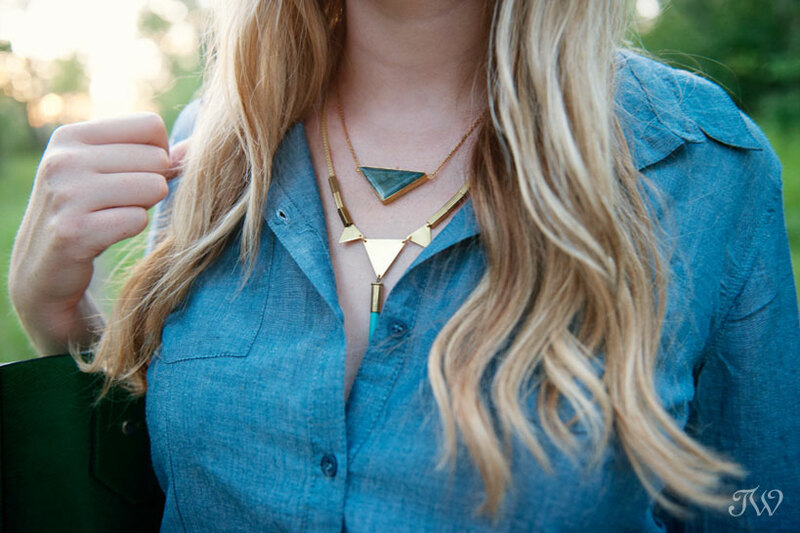 Portrait photography ideas from Perth Illustrator, Kelly Mekel. It’s Throwback Thursday again and today I’m remembering this photo shoot highlighting unique wedding dresses from Frocks Modern in Calgary. I adored the two-piece ‘Kensington’ by Carol Hannah, a draped linen ballgown skirt in blush, layered with champagne. Eloise paired the Kensington with a silk jersey ballet tank and Shannon with a midriff-baring, lace bustier. 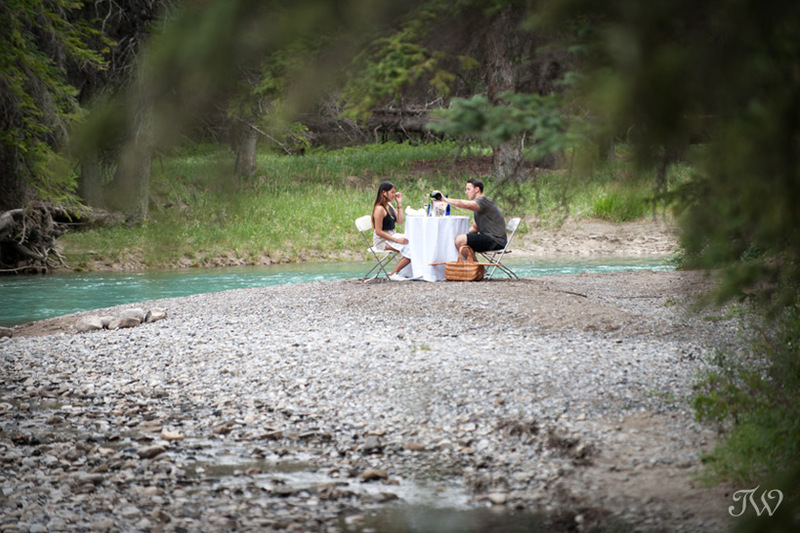 Here’s the original post featured in the current issue of Luxe by Calgary Bride, if you’d like to see. Hair and make-up by Diva SalonSpa. It was lovely to work with our gorgeous models, Eloise and Shannon. 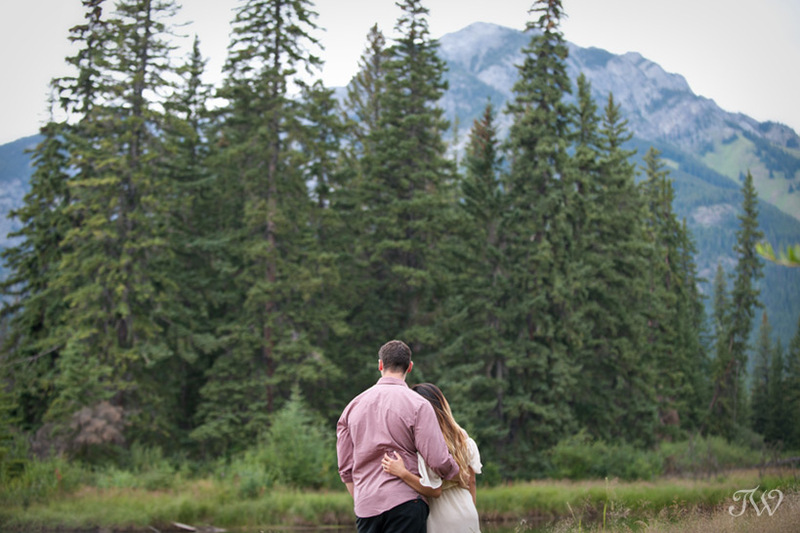 My wedding photography packages continue to evolve with the changing technology. Instead of DVDs, there is now an array of online galleries from which clients can download their wedding images directly. 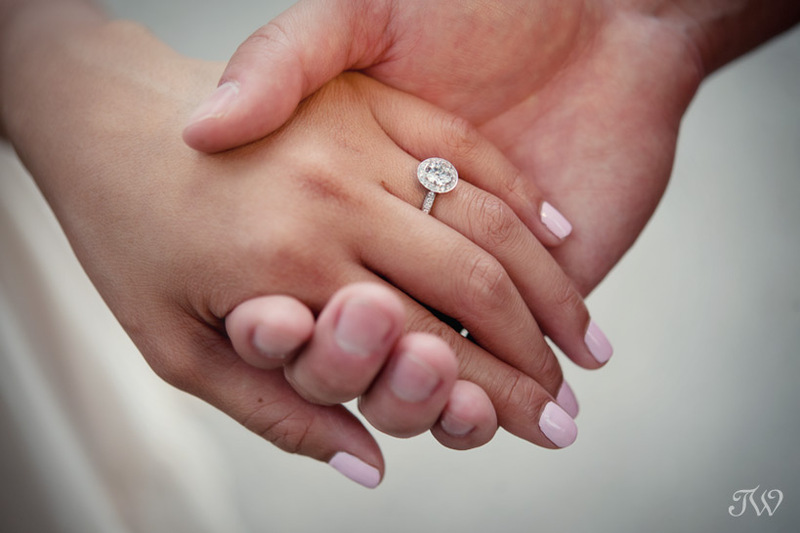 Though I’ve changed to such an online system, I still want my brides and grooms to come away from their viewings with more than a password to their images. 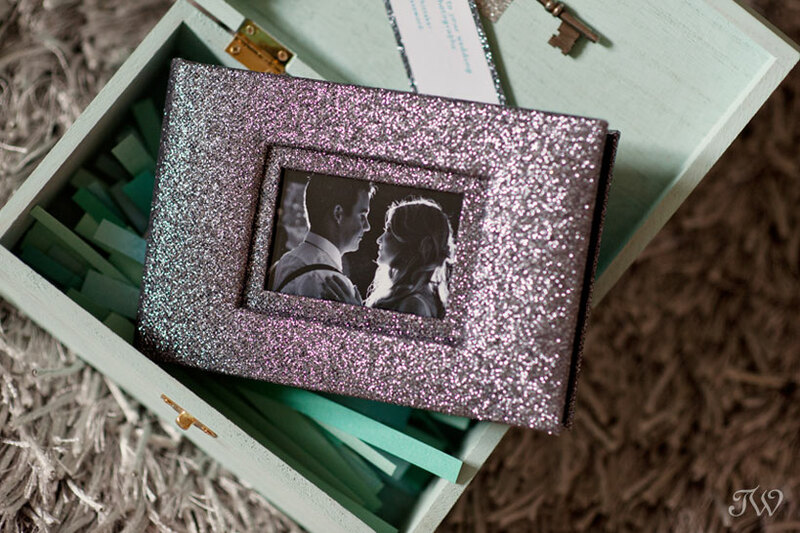 This summer, I started including this beautiful memento in my wedding photography packages. 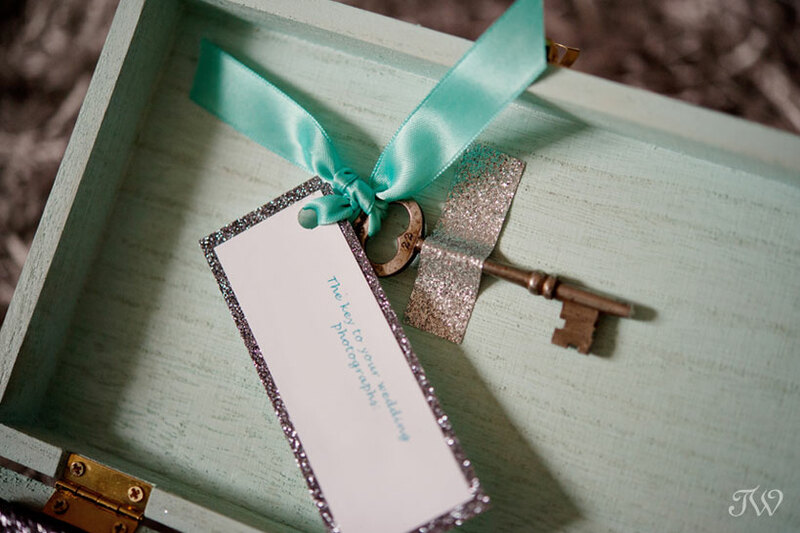 The “key” to their images is a blend of vintage and modern, and perfect for sharing with friends and family. Last week I had the distinct pleasure of working with Sharon Auld of Naturally Chic, to capture Brian proposing to his love, Clarianne. 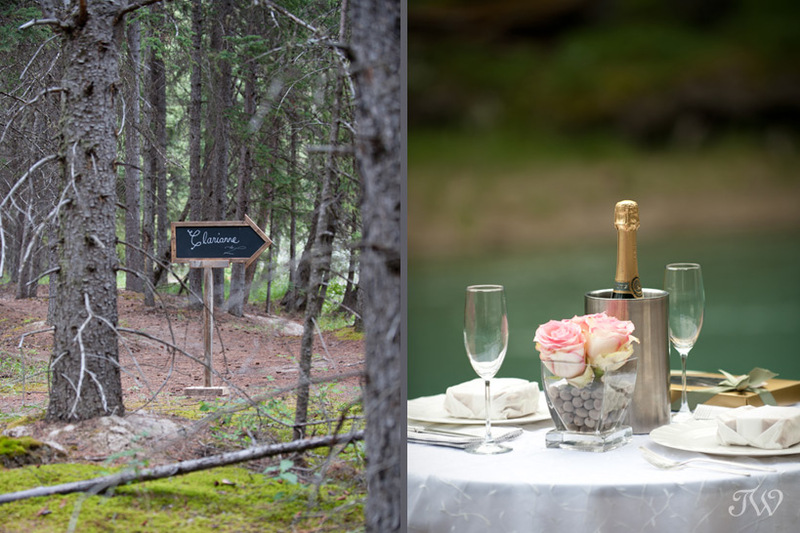 One of the services Sharon offers is planning romantic proposals in the Canadian Rockies and it was so exciting to be a part of it. 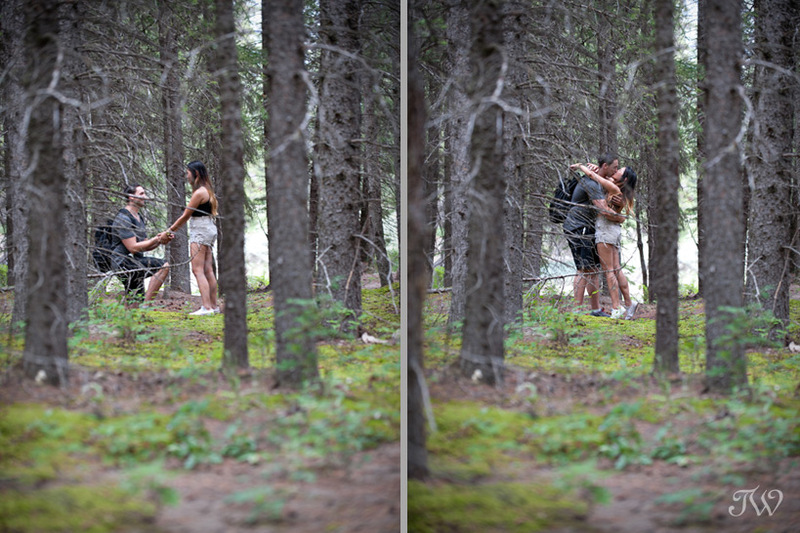 Tucked amongst the trees, we witnessed Brian popping the question, and Clarianne saying “Yes”. 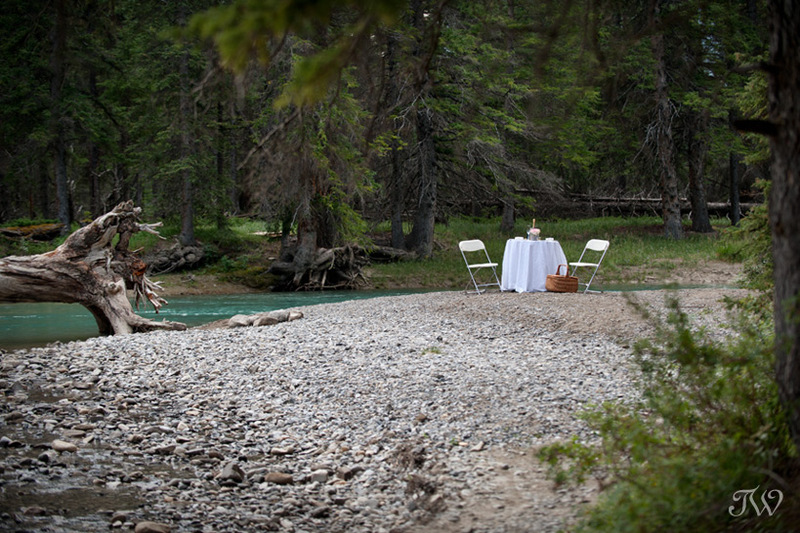 Sharon arranged a beautiful picnic for the newly-engaged couple, nestled away in the woods. 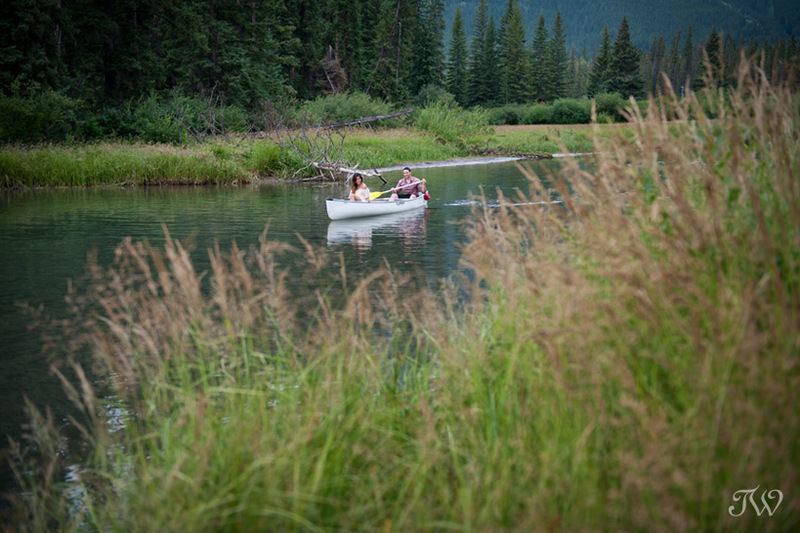 After the picnic and a quick change, we were off to take photographs around Banff. 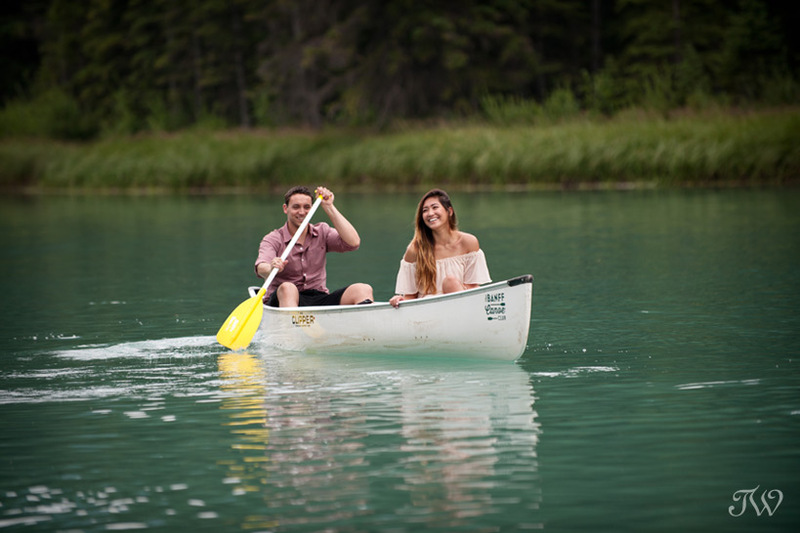 Brian and Clarianne took one of these for a spin, thanks to the boys at The Banff Canoe Club. Something about these pretty, yellow shoes just makes me think of the Beatles. Here’s a recent shoe photo shoot with a Kate Spade feel and Vespa, if you’d like to see.